Welcome to a very anticlimactic finale. Our last full day in Newport Beach was spent on the beach. It was perfectly slow and easy-going after our full, busy day at Disney. Hammy was still pretty unsure about the sand, but his uncertainty faded much quicker than the previous day. Ryan even got him to "play" in the ocean by getting him to kick the waves. Such a smart man, I married. He eventually got brave enough to venture out without me or Ryan. We had a safe trip back to Seattle. Ryan's parents, and his sister, with her family, all followed so they could come to Ryan's Apprenticeship graduation ceremony. My wonderful Mom made a taco bar dinner for everyone Wednesday night after we arrived home. I may or may not have eaten my weight in chips and sour cream, while Webb may or may not have eaten his weight in Mexican Lasagna. I can't blame him - there is no denying it's delicious. Thursday we ventured over to Seattle. Cara had never been on the ferry or into the city. 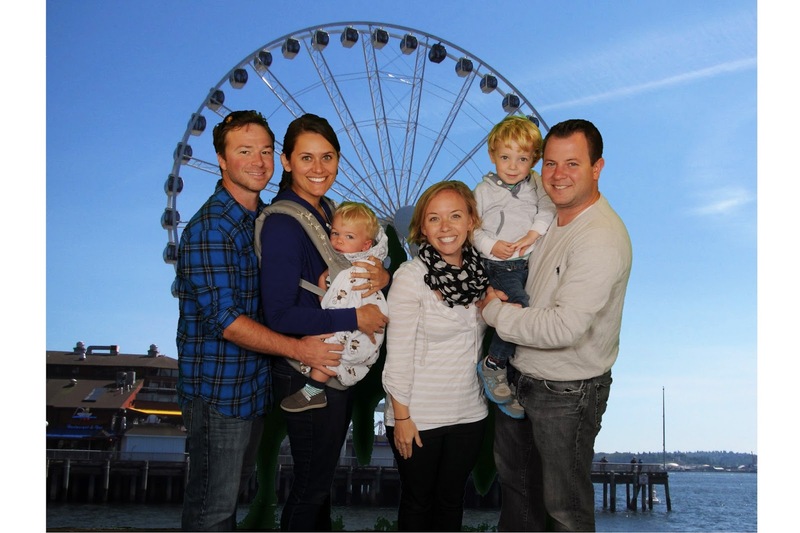 We went through Pike Place Market, had lunch at the Crab Pot, and took a ride on the Seattle Great Wheel. I may or may not have started crying a tiny bit when they stopped our car at the very stop (175 feet above Elliott Bay) and just let us dangle and sway there for awhile. Camden had been running a fever since Tuesday and it continued through Thursday night when it reached 102.8 and he fell asleep in Grandma's lap - sitting up. I have ever been so thankful to have family in my house. I was freaking out because he was lethargic (hence the falling asleep sitting up) and it was the highest his temperature had ever been. They all were really supportive and reassured me that 1) he would be OK and 2) I should not hesitate to call his pediatrician to ask questions, and to get some reassurance and peace of mind. I ended up taking him to the doctor Friday morning to make sure it was nothing more than a pesky fever - and it wasn't. So, since Camden wasn't feeling himself - we all just hung out on Friday and enjoyed the last bit of time together before heading to Ryan's graduation. Can you believe I took all those pictures while we were gone and not a single one once we were home? Fail. I can't wait to see everyone again - hopefully around New Year's. Ever since they left, Camden has asked for Meeum (Liam) and Thomas and Percy (Liam's trains) every. single. day. I think it's safe to say he loves his cousin.